Preheat the oven to 400°F. In a medium bowl, use a fork to combine the pork, sausage, 1 teaspoon of the ginger, shallot, water chestnuts, 2 teaspoons of the soy sauce, and the cilantro. Use your hands to form the mixture into 1-inch balls, placing the meatballs in a large roasting pan. Cook the meatballs in the roasting pan for 20-25min., shaking the pan every 5 min. to rotate the meatballs and brown the sides evenly. Meanwhile, bring a large saucepan of salted water to a boil. Add the snow peas to the water and cook just until bright green, about 30 seconds. Drain the snow peas and immediately transfer them to an ice bath to prevent further cooking, Drain and set aside. Skewer each snow pea with a toothpick. 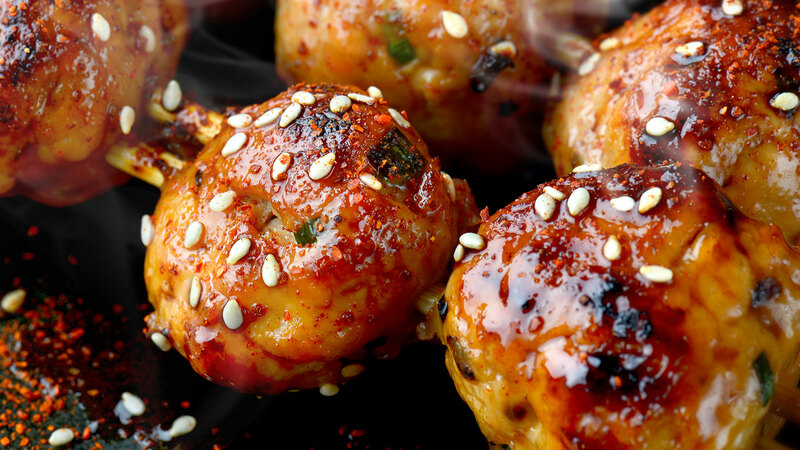 Serve the skewers alongside the warm meatballs. Deep plum in color with concentrated aromas and flavors of raspberry, chocolate and jsut a hint of toastiness. A thick, dense, and savory wine, this Petite Sirah has a luscious mouth-feel. The palate offers spicy and jammy notes of cherry and boysenberry followed by a long and full finish.